They had greens, beans, potatoes, chicken, fish — you name it. No, this wasn't the Shirley Caesar challenge, but the 8th annual Kinfolks Soul Food Festival, which touched down in Concord at the Route 29 Pavilion June 3 to kick off Black Music Month in the greater Charlotte area. The Kinfolks Soul Food Festival was a musical and food mashup of (what else?) soul, music and food varieties. It was one big block party with hundreds of fellow music and food lovers. 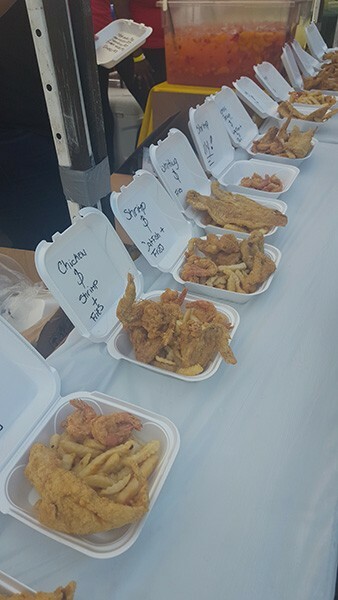 Imagine a plate full of fried chicken, fried shrimp, fried frog legs, fries, collard greens and a large dose of throwback sounds to help aid your digestion — that's what this festival was all about. This year's festival featured old-school artists including Cameo, the SOS Band, 69 Boyz, Ruff Endz and Ready for the World, sprinkled in with the newer soulful sounds from Noel Gourdin and Vivian Green. The event was hosted by legendary BET Video Soul host Donnie Simpson. Luckily, Mother Nature cooperated, with clear skies and temperatures hovering over 85 degrees. A light breeze put the finishing touch on the perfect recipe for a festival to remember. The aroma of smoke from grills, grease popping from the fryers and funnel cake goodness filled the air as the musical selection strolled down memory lane from the '70s to the present. About a dozen vendors from near and far pulled into the pavilion to provide music fans with helpings of soul food to go along with their concert experience. With prices ranging anywhere from $4 for a non-alcoholic drink to $16 for a plate of food, it was going to take some amazing food to make up for the coins customers had to spend. Owners and staff at Jo Ann's from Charlotte. "I enjoyed the performances, and the great food combined together," said Charlotte resident Tiffanie Webster. "Although a little pricey, the food was excellent." While some of the vendors came from other parts of the country, a few just had to drive the short trip up I-85 from the Queen City. D&R Catering Events was one of them. Owner Ricky Carson takes the "catering" part of his company's name literally, as he explained what made D&R stand out in such a large of a crowd. "Quality, taste and customer service is what makes our food stand out. Customer service is everything; without it, you don't have anything," Carson said. You can't underestimate personality. That's what added to the experience at another Charlotte-based vendor, Jo Ann's. The family business was created in honor of co-founder Angela Glenn's mother, Jo Ann, whose brother, Kelvin Stroud, is Glenn's partner. Full of personality and charm, the duo provided a welcoming experience that made strangers feel like they were stepping into their favorite aunt and uncle's home. Stroud wasn't shy in his use of superlatives to describe Joe Ann's food. "We have the best chicken and best fish plates, not only in Charlotte, but here at the Soul Food Festival," he said. The offerings included several items: chicken, fish, baked beans, cole slaw, potato salad and more. Straying a bit from the Charlotte scene, Tastes Like Chicken (TLC), from Columbia, S.C., offered more than just food; it offered a complete dining experience. Owner Phillip Smith said it's important for him to create a comfortable environment for those who treat themselves to his food. 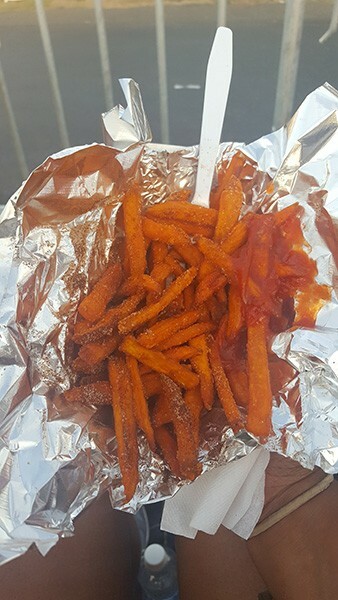 Sweet Potato Fries from Tastes Like Chicken. "People want to come and taste the food and they are standing around, so we just decided to add a couple of tables and chairs so they can actually sit down and enjoy the meal," Smith said. TLC also offered up a different type of menu that included bags of seasoned pork rinds and finger-licking good barbecue. "Our pulled pork is a big deal, and because we make it fresh, that's our biggest seller. Our fried mushrooms are another big seller. My wife makes this really great batter for the mushrooms." 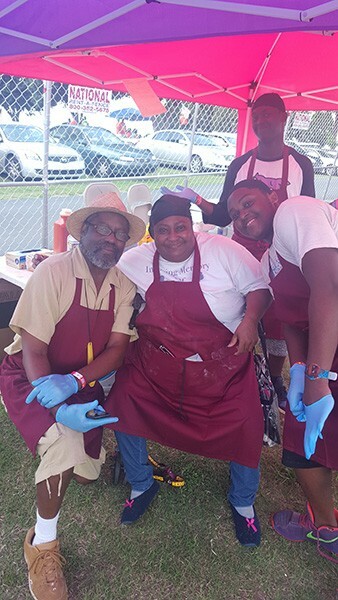 Bringing things back to the home state, Mot's Kitchen, from Greenville, N.C., set up shop at the Soul Food Festival hoping to give attendees a taste of some Down East fried delicacies. After all, owner Martha Whitaker knows a little bit about giving soul food that special touch. "I'm a southern woman and I cook downhome stuff that our people like," she boasted. "It's made with lots of love and seasoning and makes you want to keep coming back. "My best dish is collard greens, banana pudding, really just everything overall," Whitaker added. "You name it, I can cook it." Judging by the line in front of Whitaker's tent, folks just might be inspired to make the trek east to Greenville to get more of Mot's Kitchen's down-home cooking. Big Mama's Soul Food from Augusta, Ga., spanned several tents to give those in the VIP area an extra-special dose of the soul food experience. With a big grill smoking off to the side and several workers lined up to serve up helpings of food, Bib Mama's always had a line as the chefs fried the chicken to order. "I asked them to fry my chicken wings kind of soft, and they did it just right," attendee Tony Star said. Martha Johnson, of Big Mama's, noted that while her restaurant was the only vendor in VIP, it was able to provide the offerings of several vendors all in one. "We have all the good soul food you need. Our most popular dishes are the catfish and ribs," Johnson said. Milling about backstage between performances, some of the artists also got to taste Big Mama's. Soul singer Noel Gourdin appreciated Johnson's southern hospitality and said the food just added to the experience. "It was good eatin'," Gourdin said. "Great beans, 'tater salad and slaw." A line-up at L's Concession Stand. L's Concession Stand was among the vendors that was farthest from home, but making cross-country treks from Indianapolis, Ind., to give folks a little taste of Midwestern soul food is just a way of life for owner Larry Henderson. "People can't really find us in one spot. I'm always on the road," Henderson said. "We go from city to city with our food." Henderson wouldn't reveal the intimate secrets to his success, but he did spill the tea on what makes his food one of the most sought-after at every festival. "It's the seasoning that makes our food stand out," he whispered. "It's seasoned to perfection." Charlotte resident Abosede Copeland agreed that L's has discovered a great balance between seasoning its food and following it up with a colorful variety of lemonades to wash it down. Copeland had an order of the fried chicken wings and a strawberry lemonade. "The lemonade was the perfect thirst quencher with an equal balance of tart and sweetness," Copeland said. The lemonades — served in deluxe-sized cups — also contained slices of fresh fruit, making it a must-have to beat the heat. There were also liquor, wine and beer vendors to quench your alcoholic desires. After all, what's a two-steppin' party without a few good drinks? "Crown [Royal] and cranberry juice is an excellent way to get the party started and to keep it going," Concord resident Leesha Bailey exclaimed while dancing. If soul food dripping in grease and batter isn't your thing, there were other options — or, rather, ideas to bring home. Some attendees learned ways to make healthier versions of soul food in the comfort of their own home, although festival-goers weren't able to see or touch the food, since there wasn't any on the site. Handing out pamphlets to curious on-lookers, Dylan Ricci from the Pennsylvania-based Passanante's Home Food Services talked about the benefits his company offers for healthy living. "We are a home-service delivery service and we supply you with all organic natural foods," Ricci said. "That means there's no hormones, no GMO's, so this is very healthy food that's perfect for making your own soul food at home." Overall, the Kinfolks Soul Food Festival was a chomping success. "This was my first time attending and I had an awesome time," said Webster, who is already making plans to attend next year. By the time the sun set Saturday evening, hundreds had left the event, presumbably ready to take on their respective afterparties with full stomachs. For those who missed it, Soul Food travels too fast to catch up with. The fest will already be in Dallas, Tex., by the time this weekend rolls around. But there's alwasy next year.